Our freestanding stainless steel tables are fully customisable, to suit their application and situation. Whether you require a plain, freestanding table on frame-style legs or a versatile piece with built-in storage beneath it, we can fabricate the requisite item to your specifications. 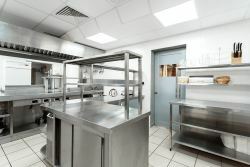 We have more than fifty years’ experience of supplying our stainless-steel products across a wide range of sectorssectors, from commercial and domestic kitchens to school food technology rooms, laboratories, healthcare practices and veterinary surgeries. All of our stainless steel tables can cope with extremes of heat from ovens or laboratory flames – the raw metal sheets are heated to around 1400 degrees Celsius during the welding process. They are also exceedingly robust and resistant to impact, making them ideal for heavy-usage environments. The metal itself is rich in antibacterial properties, which makes it the ultimate choice for any healthcare or food-preparation environment, where hygiene is paramount. If you are furnishing a laboratory, there is the option of acid 316-grade steel, for a laboratory table that will stand up to the harsh chemicals often used in such environments. Fabricated in our Nottingham factory from high-quality, 304 food-grade steel, they meet all current Health & Safety and Food Hygiene regulations. They are also tough enough to last for decades, making them a financially-sound investment for your project. For a more mobile unit, opt for lockable castors – ideal where you need a flexible workspace, or a unit that can easily be moved for proximity to workers. See also our stainless steel trolley range for more details – another useful item, especially practical for surgeries, laboratories and kitchens. Our stainless steel is also environmentally sound: the raw sheet is made from around 60 per cent recycled materials, and the end product is fully recyclable.